Well done, Joseph Schooling of Singapore! 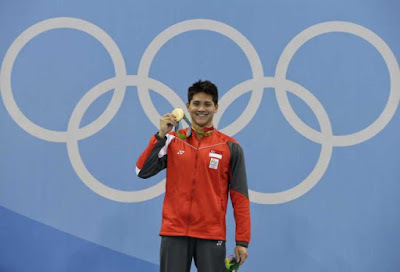 Joseph Schooling of Singapore with the gold medal on the podium after winning the Rio 2016 Olympic Games men's 100m butterfly final at the Olympic Aquatics Stadium in Rio de Janeiro, Brazil, on Aug 12, 2016. Singapore exploded in celebration Saturday after homegrown swimming hero Joseph Schooling beat US legend Michael Phelps in the 100m butterfly in Rio to win the tiny republic's first ever Olympics gold. The 21-year-old Asian champion set a new Olympics record of 50.39sec as he edged out his American idol Phelps, who ended in a sensational dead heat for silver alongside South Africa's Chad le Clos and Laszlo Cseh of Hungary.